This could get really interesting - today the Chicago Tribune is reporting that Rocky Wirtz and his family-owned Wirtz Beverage (2nd largest liquor wholesaler in Illinois, and operating in several other states) have filed a lawsuit challenging the constitutionality of the Illinois law that included the huge liquor tax increases I've written about recently. Stay tuned, we'll see if there's even a hearing before the law takes effect next week. Combine the sugar, water, lemon juice, and cinnamon in a small saucepan. Bring to a boil and reduce the heat to medium-low. Add the cherries and simmer for 5 minutes. Remove from the heat, remove the cinnamon sticks, and stir in the brandy. Yummy, and I'm going to try with a cocktail tonight. Posted on the Chanticleer Society by user Evo-lution, apparently for a competition. Wash and pit cherries. In a saucepan, combine all ingredients except the cherries and rum and bring to the boil. When liquid begins to boil, reduce heat to a light simmer, add cherries and simmer for 5 minutes. Remove from heat, add rum and cool immediately. Transfer cooled cherries and liquid to clean glass jars and refrigerate. After these adventures, I found myself with extra cherries (mostly sour), and I found myself with a bunch of cherry pits. Thought it might be interesting to see whether they have any flavor to them on their own, so I made some cherry pit syrup, and stuck some pits into some high-proof spirit to infuse. Still waiting on the infusion, but the syrup is pretty mellow. Used 1 cup sugar, 1 cup water, and a pound's worth of cherry pits. Simmered 10 minutes, then cooled completely. It's a lovely pink color, from the bits of cherry still left on the pits, with hints of cherry flavor and nuttiness. Not as much flavor as I would have liked, unfortunately. I did make a couple of cocktails with it, but the flavor was too light to come through much. Thanks to Erik Ellestad over at Underhill Lounge, I later learned that I could have made Ratafia, or perhaps Cherry Pit Ice Cream. Next time, I have to smash up the pits, and give one of those recipes a try. I should've known that a quick blog search would turn up some great experiments already run by trusted bloggers! Next time, I'll do that first. went into this delicious sour cherry streusel pie. YUM. Thank you Donovan for the title (sort of). Darn it, now I'm hearing that song in my head. What with the Chicago launch of Bols Genever this week and my attendance at the Low Country Libations seminar at Tales of the Cocktail last month, I've had a lot of genever lately. It's high time I wrote something about this most interesting spirit. Pronunciation and Spelling: They tell me it's pronounced "Jen-eee-vur" in English, "Yeh-nay-vur" in Dutch.You can spell it genever, jenever, jeniever, or even Hollands Gin if you like. General History: Genever is the precursor to traditional dry gin (which was the English's attempt at copying genever). It has been made in the Benelux region (Belgium, the Netherlands and Luxembourg, as well as parts of France and Germany) for centuries - the first recorded mention of the word is from 1623 in The Duke of Milan by Philip Massinger. Like so many spirits, it started as a medicinal tonic, but gradually became more popular for it's flavor. US History - in the 1860's, genever was very popular in the US - it was 5 to 6 times more prevalent than English dry gin, and made several appearances in cocktail books from that time. Hence why we're seeing it now again - it's an essential part of exploring this country's cocktail history. Production: Genever is traditionally made with a malt wine base. Typical grains used include corn, rye, barley and wheat. The grain is fermented, and then distilled, into something that resembles unaged (white) whiskey. It is then infused with herbs and/or flavored with herb distillates/flavorings to give it some herb notes, and might be distilled again. The only required herb is juniper, and it does not have to be discernible in the spirit. In short, genever is all about the grain distillate, with hints of herbs (maybe), whereas dry gin is all about the herbs alone. These are the two main categories of genevers. The words mean "old" and "young" but the terms don't relate to the age of the spirit. Instead, they relate to the production process and makeup of the spirit. Oude - the base spirit must be at least 15% malt wine, it must be at least 70° proof (35% alcohol), and can have no more than 20 grams per liter of sugar (the best have none). Aging is optional, but if you do it you must age it for at least one year. Most genevers are aged in used American whiskey barrels. Jonge - base must be no more than 15% malt wine, it must be at least 70° proof (35% alcohol), and can have no more than 10 grams per liter of sugar (the best have none). Jonge is often very light in flavor, some have described is as essentially vodka (highly refined distilled grain) with a tiny bit of malt flavor. There are a few products labeled "genever" available in Chicago now, and one that is coming very, very soon. Bols Genever - I attended a launch party for this one this week here in Chicago, and came home with a bottle autographed by their distiller. It should start showing up very soon in these parts - it's been in SF and NYC for almost a year now. They say it's lighter in flavor than the original genevers (and former versions of itself - they say this current recipe dates to 1820). It still has lots of character, with rich malty/yeasty flavors. Boomsma Oude and Jonge Genevers - I've only had the Oude, and not since I've tried so many others. I need to revisit this one. Anchor Genevieve - this one has rich, strong malty notes with hints of herbs. It is higher in proof than the others I've tried, and definitely makes itself known in cocktails. Zuidam Genever - more herbal than some of the others, this one has hints of malt with a variety of herb notes. I haven't had this one in awhile either, so I'll have to revisit. Oude Schiedam - (pronounced Skee-dam). 100% malt wine base - made with 2/3 barley, 1/3 rye, distilled twice and infused with only one herb - juniper. Bottled at 80 proof. This was the most authentic genever we tried, true to the old tradition of genever production made with 100% malt wine, not blended. It was incredibly malty and rich. Rutte & Zn Oude Simon - 70 proof, and a blend of malt wine and neutral grain spirit. It was softer and lighter, and more herbal than the Oude Schiedam. Rutte Paradyswijn - this is reportedly the most expensive genever in Holland, it is aged in Bordeaux casks for 8 years. Eminently sippable, it has soft malt, floral and fruit notes. Delicious. Old Schiedam Liqueur - Mandarijnen Moutwijn Likeur - At the Tales seminar, we also tasted this fantastic liqueur. Made with a malt wine base blended with neutral spirit, it has rich fruit flavors (from hand-grated mandarin oranges) blended with hints of malt. Apparently this has been discontinued and is quite rare now - I was delighted to get a taste. Els La Vera - a malt wine liqueur infused with herbs. The dominant flavor is grand worwmood (Els = alsem = artemisia absinthium), so it reminded me a great deal of Jeppson's Malort. Apparently, "Els" is a style of spirit and this "La Vera" was but one version of it. We get invited to participate in some pretty cool events. One of the most fun in recent memory was billed as a Pottery Barn Dinner. We teamed up with our new friend, potter Melissa Monroe, as well as Chef Efrain Cuevas from Clandestino, to design a five-course dinner with cocktail pairings. As many as possible of our ingredients were fresh and local, including our spirits. Melissa made all the dishes for the meal in her pottery studio, and hosted the dinner in her barn/studio. Chef Efrain and I pulled many ingredients from her fantastic garden for the food and cocktails. She even has some roosters running around in the garden - see pic below. Here's a rundown of the menu, with the drink pairings. Unfortunately, I don't have photos of the food & drink - we were so busy making them I didn't take pictures! You can find some more photos of the event here and here (in an article about the dinner). 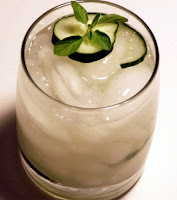 Drink: Cucumber Caipiroska - posted on my blog last week. Notes: I was really happy with the garnish for this one, I used a cucumber wheel with a sprig of oregano flowers in it. It was a great starter drink, and the cucumber and herbs played nicely with the gazpacho. Muddle tomatoes, simple, herbs and lemon. Add aquavit and ice, shake well. Strain into cocktail glass, garnish with cherry tomato on rim. Notes: This one was a bit harder to pair with - salads are tough. I aimed more at the blossoms and cheese, and to integrate the flavors of the drink with the vinaigrette. It wasn't my favorite of the set, but I think it worked relatively well, especially with the cheese-stuffed blossoms. Combine gin, juice, simple and basil leaf in shaker. Shake well with ice, strain into glass filled with ice. Top with soda, garnish with sprig. Notes: In this one, I tried to provide a nice foil for the rich cream sauce with some citrus and a hint of bitter from the grapefruit, along with some fresh herb notes from the basil. Notes: I was a little worried here too, since chicken is so lean. We went lighter on the drink, and pulled in the Aperol for depth and balance. This drink worked especially well with the maple glaze, it was really spectacular. Shake gin, lime, ginger syrup and one sprig of mint with ice. Strain into cocktail glass. Garnish with 2nd sprig. Notes: This dessert was rich, so I went up a little in alcohol to balance out the fat and intensity of the flavors. The drink worked especially well with the ice cream, the mint and ginger played very nicely with the peach and helped cleanse the palate after the rich ice cream. All in all, a fantastic evening of food, drink, pottery and conversation. Recently I wrote about the liquor tax increase taking effect on September 1, 2009 in Illinois (link to .pdf from IL Dept of Revenue). The increase was included in the "Illinois Jobs Now!" act, which is a $31 billion capital improvement bill - lots of road, bridge and transit expenditures, as well as some money for schools and community development. To pay for it, there are lots of new taxes and fees, including an increased sales tax on candy (which has it's own headaches), sweetened tea & coffee drinks, increase title, registration and drivers license fees, taxes on grooming & hygiene products, and the controversial introduction of video gambling. The increased beer, wine and spirits taxes are only expected to raise $119 million, so they're really a small part of this massive spending bill. However, the increases leave Illinois with the highest liquor taxes in the nation. That's right, the HIGHEST in the nation among non-control states, by a factor of 31% over the next highest state. One of our customers (thanks Adam!) gave me a handy-dandy chart today that shows all the tax rates in all the states in the US that are not control states (meaning the state governments do not run the liquor stores and/or act as the distributor - they are traditional three-tier states, so we're comparing apples to apples). Although the Marin Institute says this is good news, this is really unfortunate for our industry and the consumer who imbibes. Here's the ranking by state liquor tax rates. Consumers who Drink. In most cases, a 750 ml bottle of spirits is going to cost at least $2 more, perhaps $3, regardless of the bottle's pricepoint, and before sales taxes. In Chicago, for example, once you factor in the federal, state, county and city manufacturing taxes, as well as sales taxes, more than 25% of the cost of a $30 bottle of spirits is tax - not money to the manufacturer, distributor, or retailer - taxes. Liquor stores near the border with another state that has lower taxes. Wisconsin is $3.25 per gallon, Indiana is $2.68 per gallon. Illinois is $8.55. The difference translates to a few dollars per bottle - in each case, it's over $1 per 750 ml bottle in tax, before markups. People near borders will cross them and stock up, even if doing so is technically illegal. So we're sending business to our neighboring states. The Little Stores. The single, independently owned liquor stores will probably suffer. They often don't have the resources and clout to buy huge quantities and stock up before the increase, or negotiate with the powerful distributors, so they'll be hit with the increase (and price increases) sooner. And little producers, like us, don't have a lot of wiggle room on pricing to absorb the tax, so our prices will go up, despite the tough economy. Bars and Restaurants. Bars and restaurants are already suffering in this economy, and now they'll be forced to either raise drink prices or work on a slimmer margin, neither of which is particularly appealing. Once you break the tax increase down to a per-ounce count, in theory it would be about 5¢ per ounce. In reality, after distributor markups, it will be more like 8¢ an ounce in additional tax per ounce, or around 25¢ per cocktail (assuming about 3 oz of taxed liquid total). It may not sound like a lot, but that 25¢ per drink will add up quickly. And it doesn't matter what caliber of spirits you're using, if it's over 20% alcohol, it's the same tax regardless of price. After a brief break (for Tales of the Cocktail), MxMo is upon us again. Our hostess Amelia over at Felicia's Speakeasy has chosen "Vodka is Your Friend" as the topic for this month. She posed some questions along the way, such as "what do YOU like about vodka? Why do you keep that bottle of [brand] on your shelf? What vodka-based drink has stayed in your personal book of beloved cocktails? ‘Fess up." Despite what many of my cocktail-loving friends wish was the case, vodka is still the most popular spirit in the US. I spend lots of time in liquor stores, bars and restaurants, talking to people about spirits, and vodka is undoubtedly still at the top. Many, many people are afraid of gin, whisk(e)y and other categories, and unfortunately many people out there like a sweet cocktail where you can't really taste the liquor. So whether we like it or not, vodka ain't goin' anywhere anytime soon. There, I said it. We make vodka (and it's really good, if I do say so myself). When I have it, it's usually over ice with a lime wedge or twist of lemon. I'm a simple girl when it comes to vodka. Sometimes I order a vodka-based cocktail too, but that's usually only if it's made with our vodka. And sometimes I make cocktails with our vodka, usually for an event, or cocktail pairing dinner. Here's a cocktail we served last week at an event (more on the event later), and have been enjoying ever since our garden cucumbers and herbs started growing en masse. Muddle lime, 3 cucumber wheels, one sprig of oregano and syrup. Add vodka, then add ice and shake with ice. Pour shaker contents into glass, garnish with remaining cucumber wheel and sprig. FYI, for any who might not know - a Caipiroska is simply a Caipirinha made with vodka rather than cachaça. Enjoy! Happy MxMo and thanks to Amelia for hosting! Perennial is hosting a good-spirited mixology competition among Chicago-area bartenders, and this week I was finally able to attend one of the head-to-head matchups. This round, it was Adam Seger from Nacional 27 versus Tim Lacey from the Drawing Room. Both used Bacardi 8 as their base, with a variety of jui ces, fruits, liqueurs and bitters. Tim even brought his lovely wife Lisa, to play along with his Tiki-inspired drink on her ukelele. It was a close, close match. The guest judge, Lin Brehmer from WXRT deemed it too close to call, and deferred to the popular vote among the audience. Once the ballots were counted, the tally was 49 to 47. Adam Seger won the nail-biter. Congrats to Adam, and well done, Tim! Last week, I had the pleasure of attending a small luncheon with Richard Paterson (aka The Nose), the Master Blender for Whyte & Mackay. We were there to talk about and taste Scotch whisky from The Dalmore, which is owned by Whyte & Mackay. I don't usually go to these things, but my friend Lori invited me and I've been meaning to learn a bit more about Scotch, so I went. It was a lot of fun, and The Nose is a very entertaining host. What we tried - The Dalmore 12, the Gran Reserva, The Dalmore 15, and King Alexander III. Interestingly, all of these are made from the same distillate - the variations come from the duration of aging and type of wood used, and in the blending, which The Nose oversees. The Nose favors a wide range of casks - across these whiskys, they use sherry casks (and butts), used Madeira, marsala, bourbon, wine and other barrels, as well as first-fill oak . Someone in the know once said that 70% of a whisk(e)y's flavor comes from the wood, so these choices obviously have a big impact on the flavors. What I tried - I (and only I, at this lunch anyway), got to try the Dalmore 50, aged 50 years. It supposedly retails for $1,500 for 100 ml, so it was a rare treat indeed. Despite it's age, it was not overly woody - it had great depth and complexity, and a very long, rich finish. Loved it. Not sure I'd pay $1,500 for 100 ml, but was grateful to get to try it and won't soon forget it. Interestingly, the next day, I got a notice that Glenfiddich is also releasing a50-year old Scotch for $16,000 a bottle (not sure what size of bottle). Guess super-aged spirits are the new thing in the Scotch world. Tasting Technique - The Nose's tasting technique is completely different from the other whisky expert with whom I have sampled. In fact, I think the two might come to blows over it if they were to talk about it in person. The Nose does NOT want you to warm up the spirit, and is open to adding a few drops of water where appropriate. 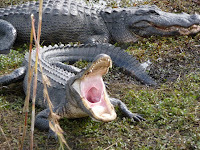 They agree on nosing with each nostril, and moving the spirit around, but have different approaches about what to do with the spirit in your mouth as well. This sounds like a great opportunity for me to practice my technique at home, me thinks. The Nose showed us a cool trick that I hadn't seen before. Fill a glass 2/3 with water. Then put a handkerchief or napkin (clean, please) on top of the glass. Poke your finger through a couple of times, to get the napkin wet. Then, pour whisky on top, slowly. Pull the napkin out quickly, like you would for that trick when you remove the tablecloth and leave the dishes behind. The whisky will be left floating on top. The Nose said you could even insert a straw and drink the water first, and it would stay separated. I'm sure this is just a trick with the densities, but it was cool nonetheless. I'm totally going to use that one. I used to be in HR, so I always keep an eye out for labor/employment stuff in the liquor industry. Lately, the ongoing recession is being blamed for significant cuts at some of the world's largest Scotch producers. At the Dalmore lunch, one of the topics that came up was the plant closures and resulting layoffs that Diageo (owner of Johnnie Walker, among others) is implementing. The decision has been covered widely in the drinks press, and there have been a number of protests against the actions, as well as analyst reports that it's not really due to the recession (the whisky industry has continued growing, after all). It's a tough situation, because the Scotch industry is so entrenched in some of the small towns where the plants are located, in both the history and the economy. However, with the consolidation in the liquor industry, most of the brands are owned by a global conglomerate like Diageo, which will continually seek to streamline, optimize and consolidate it's operations across business groups and brands, especially in a tough economy. At the time, Whyte & Mackay had not yet announced their own layoffs, which were announced this week. Interestingly, they made a profit last year, and not an insubstantial one (£25.6m pretax profits over 18 months). Yet they are still being hit with cuts. Sounds a little like big-firm politics to me - sometimes the big conglomerates have to offset losses in another area with costs from a profitable business unit, which is especially frustrating to the individuals in that unit. From the scuttlebutt following these announcements, additional layoffs and closures may happen in the Scotch world. Guess we'll just have to wait and see, and sip, in the meantime.